The mountains of Georgia are a wonderful, wild and incontaminated place. A true heaven for the trekking and outdoor enthusiast. You can choose among several itineraries, it pretty much depends on how long you will be staying there. Many local agencies will be happy to help you organize your trip, even by providing horses and some small comforts to maximize your enjoyment. Our purpose is to get hikers to discover this country and especially its mountains and this means: advance knowledge of the place, the trails, the equipment, the local culture and, sometimes, the language as well. Even though mobile phone coverage is available in some mountain areas and the distance from Tbilisi may not seem worrying, Svaneti, Khevi, Khevsureti and Tusheti have very poor roads, if any. A 4wd vehicle can negotiate some valleys but going from Tbilisi to Omalo takes more time and effort than reaching the Turkish border. - You'll have to plan in advance and approach any organizational matter with care. You'll be going to a very remote area. Sort out any issues regarding how to get there and how to get OUT of there. - High elevation and wind-swept slopes make for weather unpredictability, especially in June and September. The temperature can vary dramatically from day to night. Keep it in mind when you choose your gear. - Valleys have mostly steep slopes and, as much as you can try to follow a high route, there will be heavy climbs up and downhill. If you plan to spend several days on a self-supported hike your load will probably be heavy, so pack wisely. - Remember those clearly marked Alpine trails? Forget them. You may be lucky enough to find some tracks left by shepherds, but it's imperative to have good map reading skills (and a little knowledge of the Cyrillic alphabet, since maps are mostly from the former Soviet military). 2) don't rely on them for fresh food supply. Their diet can be poor and you may only be lucky enough to find some cheese and bread. 3) they love their country and their mountains: this respect sometimes has a religious meaning. Superstition or not, we have to respect their beliefs. Some places are off limits, often for religious reasons or for superstition. Be aware of this, don't leave the trails if you can. 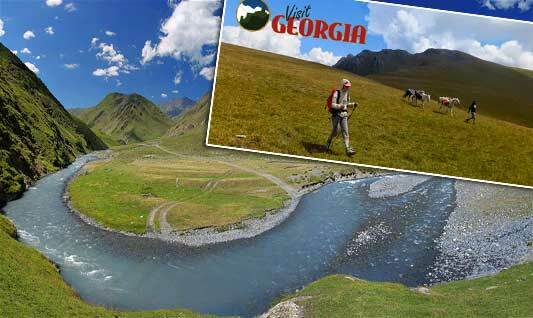 Our planned trip will go from Shatili to Omalo, across Atsunta Pass and along the Alazani river. This wonderful hike will take us through the stunning Tushetian scenery, just a few kms from the Chechen border. You will be most welcome to join us. Tireless, discovery-hungry travellers, outdoor enthusiasts and reckless adventurers! A bit of training is adviceable, since it will be a great experience, but no a city-walk for sure! For more information about the Big Trek Shatili - Omalo, go to the detailed program.